How to Build Tabletop Game Boards | KaBOOM! 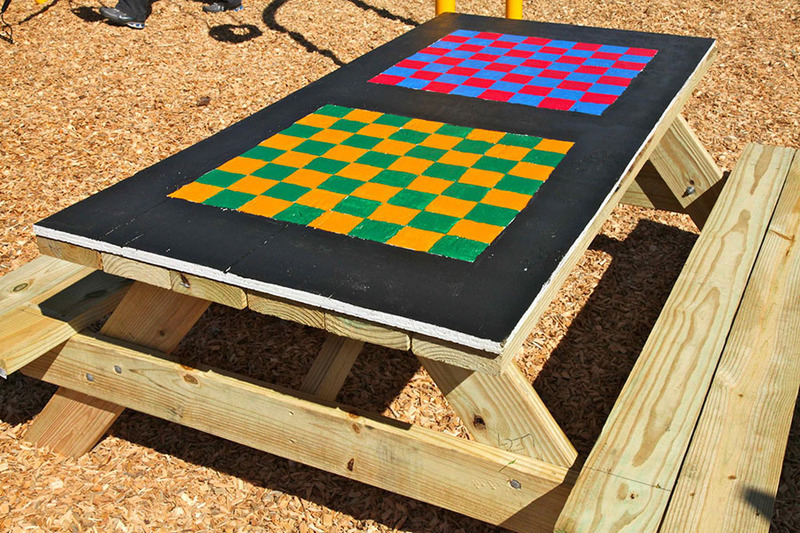 Games like chess and/or checkers can be played by people of all ages, and providing this opportunity will encourage youth, teens, adults, and seniors to frequent the playspace. These games can also be a perfect catalyst for playspace programming! They can also add to the beautification of a playspace. Ideally, this project involves adding a twist to existing, ordinary picnic tables. Measure the surface that the table-top game board will be attached to. Using the measuring tape and chalk line, measure a rectangle on the plywood board with matching dimensions to your table-top surface. Using the circular saw, cut the plywood down to match your table-top measurements. Sand all edges until smooth. Prime both sides and all edges. Decide what type of game board you would like to make. Popular choices are chess/checkerboards, Chutes and Ladders, tic-tac-toe, or Dots. If you are making a board for a game that requires players to write or draw (ex. Tic-tac-toe), use chalk paint on the game board and provide chalk for players! Use the yard stick, painter's tape, and pencils to create the outline for your game. Fill in your game using exterior paint and painting supplies. When the piece is dry, attach it to the table top surface using the 1 ⅝" deck screws.